Watch Saturdays beginning October 19, 2013 at 2pm on WMHT TV. 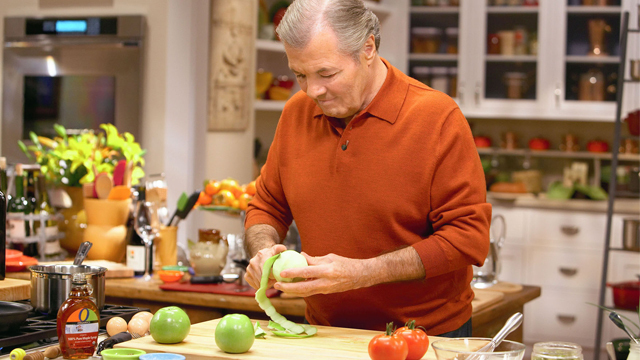 Culinary icon Jacques Pépin returns with a new line-up of healthy, home-cooked meals in JACQUES PÉPIN: MORE FAST FOOD MY WAY. This season, Pépin creates nearly 100 delicious recipes for every occasion — from a light snack to an elegant dinner — using readily available fresh foods, supermarket staples and simple techniques. Taking inspiration from around the world, Pépin's lamb stew, paella and Tibetan bread incorporate Asian, Latin American and diverse European influences, including his classic French background. Each episode contains four or more dishes, including minute-long recipes for croque monsieur tidbits, an instant red-pepper dip or butter bean canapes, along with Jacques' valuable tips and techniques. Jacques’ world travels influence his cooking and with this menu we’ll savor the essence of Spain. Bold and Spicy Gazpacho kicks off the meal followed by Shellfish and Chicken Paella. A detour to pick up some Caribbean flavors makes the last dish of Pineapple in Dark Rum Sauce worth a trip to the kitchen. Jacques cuts the cooking time of a whole chicken in half with a pair of shears and a few cuts of his knife in this flavorful Roasted Split Chicken with a Mustard Crust. Fluffy Mashed Potatoes make the perfect side dish. Pizza is made quicker and easier when you use a ready made base, and Jacques personalizes it with an unusual twist when he crisps Lavash to make Smoked Salmon Pizza garnished with capers, onion and cilantro. He concludes with a no-frills Greek Yogurt, Walnuts and Honey arguably one of his fastest desserts. Combining silky tuna, crunchy apples, herbaceous chives and piquant shallots, Jacques assembles a mountain of fresh Bluefin Tuna Tartare with Apple to open the show. Inspired by the flavors of the east, Jacques prepares exotic Lamb Burgers with Feta Cheese cooked rare and served with a refreshing Yogurt-Cucumber Sauce and a gratin of sorts called Corn Parfait. He ends his cooking adventure with Cream Cheese and Fruit Medley. Surprising tastes, tricks, and techniques in this show as Jacques checks the labels on canned ingredients to make Pumpkin Gratin. He hides treasures inside Tomato Surprise and naps the Grilled Striped Bass with Romesco Sauce. To complete the menu some of the best Californian brandy made, makes its appearance in Cherries in Armagnac Sauce with Pound Cake. Jacques shows Claudine how presentation can make a simple, traditional dish truly elegant by layering feta, cucumber and onion between tomato slices to make Tall Greek Tomato Salad. Poached Salmon in Sour Cream Herb Sauce follows as Jacques reveals his father’s dislike of olive oil to his daughter, Claudine. Together they make a variation of his Mother’s recipe Stew of Peas and Carrots -- a meal in itself! Dessert is pure simplicity in Sweet Ricotta Gateaux with Peach Sauce. Show 208 The Egg First! Jacques loves eggs, all ways! Cooking them is an important technique and who better to demonstrate the perfect hard cooked egg than a master of technique! Jacques begins this menu with hard cooked eggs used as a garnish in Asparagus Fans with Mustard Sauce. Simply seared in moments, Scallops Grenobloise, is the ultimate fast dish – and when served with Potato Gratin with Cream, it makes a rich main course. Jam Tartines with Fruit Sherbert concludes the menu. Bread takes time to make but Jacques shows viewers how to mix and bake a loaf of bread in one pot in his Slow and Easy Bread in a Pot. Next he shares his favorite eggs prepared in little containers known as Cocotte Eggs with Creamed Mushrooms. When Jacques raids the pantry and freezer, he finds the fixings to make a Ragout of Broccolini, Beans and Sausage. Fresh berries and a neat twist on a bought pastry crust end the meal with Cookie Dough Raspberry Tart. If left on a desert island, Jacques thinks he’d be quite happy if only there were some chickens! For Jacques, the prize part of the chicken is the thigh and he thinks you’ll agree when you try Crusty Chicken Thighs with Mushroom Sauce served with a tasty Fricasse of Brussels Sprouts and Bacon. An inspired use of instant potato flakes to thicken a soup shows up in the fast cooking Seafood Chowder topped with fresh crabmeat. To end on a relaxing note, Jacques arranges a presentation of Stilton with Apple and Nuts to accompany a delicious glass of vintage or aged Tawny Port. Living close to the shore in Connecticut offers Jacques the opportunity to celebrate the bounties of the sea. He loves seafood and begins this menu with a Picante Mussel Pilaf. Next, Jacques surprises viewers with a novel take on a breadcrumb coating for Onion-Crusted Sole with Anchovy Butter. He ends with a popular French dessert that’s not quite an omelet… not quite a custard… it’s an Apricot Clafoutis. When Claudine comes to visit, Jacques wants to spend the day with his daughter and granddaughter so he turns to his pressure cooker to prepare a Lamb Curry in less than half the time and serves it over Rice with Raisins. To begin the meal, Jacques manages to stretch four ounces of sea scallops into a dish serving four people in the form of Scallop Pancakes On Boston Salad -- the smell of the pancakes as they cook make it impossible for them to resist sharing the first ones straight out of the pan. For the finale, Jacques transforms a tortilla and a can of apricots into a beautiful and delicious Crisp Apricot. For Jacques, nothing beats an earthy soup to keep you warm during the coldest season and his Hearty Vegetable Bean Soup hits the spot. To spice up the evening, he creates a pocket in boneless chicken breasts to fill with a tasty stuffing in Chicken Supremes with Tapenade and Mushroom Sauce served over Vegetable Couscous. The meal ends on a sweet note with a Pear Compote and freshly baked Almond Crumble Cookies. Jacques makes the sweet, nutty flavors of winter squash tickle the palate with a warm and creamy Butternut Squash Velvet whilst he admits to supplying his brother with seeds of this New World squash. Blossoming roses of creamy fish in Fillet of Sole with Mushroom Sauce are paired with Peas, Mushrooms and Endive along with tips to help keep your sauce from breaking. The meal ends with an unusual combination of Seckel Pears in Coffee and a grated chocolate garnish. Light, lean and big on flavor! This menu features Small Crocks of Shrimp in Hot Vegetable Broth and lean pork tenderloin in Pork Medallions with Grapes and Pomegranate Sauce accompanied by a mélange of Spinach, Macadamia Nuts and Raisins. For dessert, it’s Butter Pecan Ice Cream paired with Apple Maple Topping making a feast worthy of any company! With daughter Claudine visiting the kitchen, Jacques uses local blue cheese to make Mini Savory Cheesecakes on Arugula. Even when Claudine fails to coat the sides of the soufflé dishes with breadcrumbs, they can still be unmolded for serving! Steamed Scrod Packages in Pimiento Sauce and Butternut Squash Saute complete the menu’s savory dishes leaving a comforting Tapioca Banana Coconut Pudding for dessert. For an unusual crispy snack to keep friends munching, Jacques makes Crunchy Kale. Then, forget long hours over the stove, Jacques shows how to make chile without fuss in a pressure cooker for a game day favorite Chile Con Carne with Lettuce and Cheese. For dessert, Pears Bonne Femme are easy and decadent. To add an eclectic note and bit of extravagance, Jacques makes potato pancakes, known as Criques. Served with Californian caviar these tasty morsels are both delicious and environmentally friendly! Endive, chicory, Belgium endive -- Jacques explains these vegetables starting with Rigatoni with Lettuce and Eggplant and Sauteed Julienned Endive. A trip to the fish counter results in a harvest of some ocean “greens”, too! Seaweed-lined bamboo steamer baskets hold fresh seafood in Steamed Fish and Shellfish Baskets. The pantry supplies dessert…dried figs and walnuts poached in wine and honey complement each other in Sauteed Stuffed Figs with Blueberries, a dessert that pairs perfectly with the sweet fortified wine, Madera. Stuffed Pork Tenderloin on Grape Tomatoes is impressive but Jacques shows that making this spinach and cheese stuffed roast doesn’t have to be complicated. Setting the stage for a dinner to remember is a simple version of an elegant classic, Cream of Leek and Mushroom Soup. Mini Almond Cakes doused in ruby red Raspberry Sauce crown this special party menu. When Jacques finds a new bread at a local restaurant he cannot resist developing his own version. The result is the first dish on the show, Tibetan Flatbread. Cooked in a frying pan, Claudine holds her breath as Jacques flips the bread after seven minutes. Next, Jacques reveals that he doesn’t throw out broccoli stems – in fact, the stems are his favorite part of the vegetable and a key ingredient in his Risotto with Broccoli Stems. Salmon Burgers on Baby Arugula follow before Jacques shows the versatility of citrus by candying the rind and cutting Grapefruit Supremes. Little tricks make life in the kitchen so much easier, and Jacques is always ready with tips to simplify or speed up a task. Here he pops clams into the freezer for a few minutes to make opening them a breeze for his Baked Clams Madison. Jacques suggests cod as the perfect choice for those who hesitate to cook fish. It stays moist through cooking and, when topped with an olive crust in Cod in Olive-Tomato Crust, it packs a lot of flavor. Skillet Broccoli Bits make a great pairing with the fish. Finally, warm hazelnut-chocolate spread is mixed with ice cream to form the sauce in Mango with Nutella Sauce. When in doubt, start with dessert….and it’s easy when you use a tortilla for the crust as Jacques does in Crisp Pear Tart. Fresh bay scallops are shown in the shell at their very best, and become too tempting to Jacques who can’t resist nibbling on them, in a light, fresh tasting Bay Scallops in Mignonnette Sauce. For a homier dish, Jacques shares his comforting Sausage Patties with Pumpkin Seeds and Mushrooms served with Cornmeal Mush. Pantry staples and convenience foods take the stress out of visitors popping in! Jacques begins with a convenient, pre-made pizza shell for his Chorizo, Mushroom and Cheese Pizza. With a box of pasta and can of tuna from the cupboard, he creates Orecchiete with Fennel and Tuna. Lastly, a couple of eggs combined with the pantry staples of flour and sugar are whipped up into a kid friendly dessert, Popover with Apricot Jam. Jacques reminisces about his childhood and celebrates the bounty of the season. He cooks up a batch of ratatouille that can be served two ways – perfectly delicious on its own or with pasta in Ratatouille with Penne. Seafood stars in Shrimp with Cabbage and Red Caviar, and delicate peaches end the show in Jacques’ classically made Peach Melba. Born in Lyon, France, Jacques demonstrates his regional version of fried and poached eggs as he makes the classic salad of Frisee Aux Lardon. Then, with thoughts of spring, he makes Spaghetti with Raw Tomato-Anchovy Sauce. A sweet ending, Jacques talks of time with his granddaughter while making impressive to look at, but simple to assemble, Chocolate Cups and Chocolate Rocher with Hazelnuts and Cornflakes – a combination of chocolate, hazelnuts and cornflakes.